Street art will never again be what it was before the age of mass surveillance. If the authorities wanted to catch Banksy, they could easily do so, but he’s making a lot of money for someone, and he’s a harmless amusement, so on he goes. Ooh look, a mouse with a gun on a building wall. And over there’s the rat hole. How clever. Quick, let’s tear down the building and sell the wall for millions at auction. In 1970s and 80s New York, the king of street art was probably Jean-Michel Basquiat, of whom we’ve written elsewhere. But unbeknownst to me until recently, there were other street artists employing the same blend of witty enigmatic graffiti-aphorisms together with Situationist-style hijacking of popular advertising which Basquiat made famous during his SAMO period. Manuel De Landa is today known mostly as a philosopher, author of such books as A Thousand Years of Nonlinear History and, more recently, Assemblage Theory. He’s probably the world’s best expositor of the (maddeningly obtuse) philosophy of Gilles Deleuze. But before he published his first book of philosophy in the 1990s, De Landa was part of the downtown art scene and the No Wave film scene. During that time, he tagged up New York under the name ISM ISM (perhaps taken from John Lennon’s lyric in “Give Peace A Chance”) and produced some interesting street art that holds up well today. I’m pleased to see that some of his work from that time is finally being made available, and just today I stumbled upon this film that De Landa made in 1979 documenting his street pieces and graffiti. ISM ISM (1979), Manuel DeLanda from Anthology Film Archives on Vimeo. In addition to showing off De Landa’s defacements of cigarette billboards, the film is now also a document of New York city streets in the late 70s—that decaying, dangerous, yet somehow also glorious time in the city’s history. Watching the film now, we see one of the reasons why the city was able to give rise to so much creativity then: people were left to fend for themselves. Those brave enough to stay in the city, or to venture to it as De Landa did in 1975, were able to make it their playground. 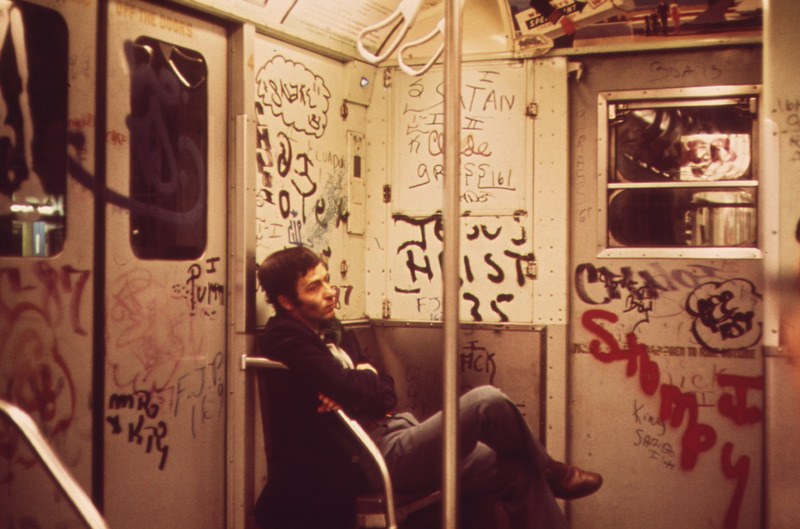 Artist-intellectuals had the whole urban environment as their canvas, and could remake it in their own images—to deconstruct imposed meanings, or impose their own new meanings. Imagine trying to deface a billboard in downtown Manhattan today. The cameras are everywhere. What we have instead today is paid corporate artwork which imitates the avant-garde of yesterday. (And if you go a little further down the rabbit hole, much of yesterday’s “avant garde” was corporate-controlled from the beginning anyway.) The Spectacle consumes everything. Gucci store window display. MixC shopping mall, Shenzhen, China, 2018. ISM ISM has been made available by the Anthology Film Archives in New York. There is also an accompanying book put out by J and L Books. Check out Manuel De Landa’s more recent film work on Vimeo, where he has also uploaded his 1982 film Harmful or Fatal If Swallowed, an amazing piece of film collage showcasing the madness of New York street life.